Compact Wireless Photo All-In-One with Mobile and Cloud Printing. 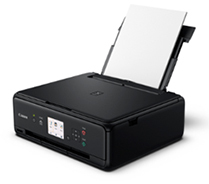 This compact wireless Photo All-In-One printer, with cloud and mobile printing solutions. A new variable angle operational panel design allows great visibility regardless of a user's sitting or standing operating position. This web app allows you to print and edit photos on-the-move with your tablet PC, with a wide selection of templates to choose from. 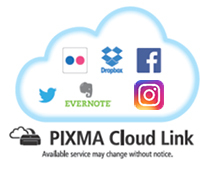 With PIXMA Cloud Link, you can now print from popular online services, such as Facebook, Twitter, Flickr, Evernote, Dropbox. 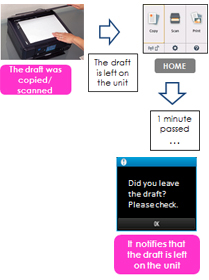 Now you can also print photos stored on a smart device through Cloud. PP-201 / Borderless Approx. 39secs. sFCOT / Simplex Approx. 20secs. 1-up (Bordered / Borderless*15) LTR, A4, 4 x 6", 5 x 7", 8 x 10", Square 5 x 5"
1-up (Bordered*16 / Borderless*15) LTR, A4, 4 x 6", 5 x 7", 8 x 10", Square 5 x 5"
Photo Index LTR, A4, 4 x 6", 5 x 7", 8 x 10"